The ancient Greek, then Roman, then Byzantine, then slav town of Kherson in the Crimea has been in decline so long that it is almost defined by this feature. Once ruled by Kiev, it came under the direct rule of the Golden Horde when they invaded and it has been sacked and fought over repeatedly. It is now notionally within the Genoese sphere of influence, but it is perhaps the least of their possessions and it is no secret that they would not fight were the Tatars again to choose to plunder it. 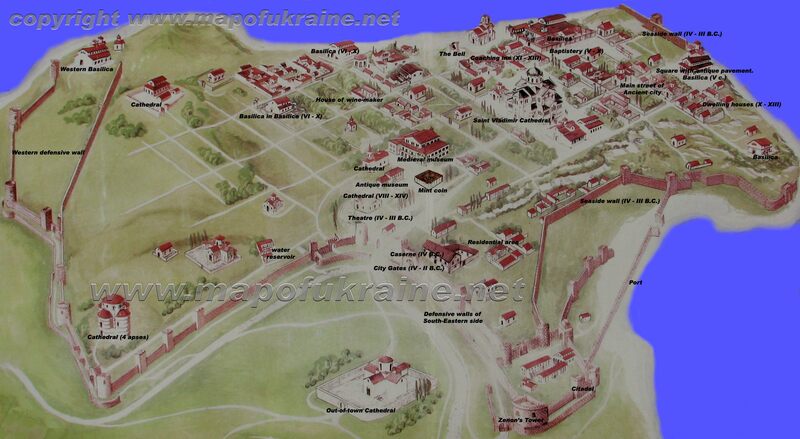 Officially, it is part of the Principality of Theodoro, a pocket semi-state ruled from the fortress of Mangup. The Gavras family who rule in Mangup, though, offer little real support or protection. Thus, Kherson is prey to frequent bandit raids, and only ad hoc bands of locals and the hired guards of remaining grandees and merchants make any attempt to resist them. As this map of the city shows, much of it within the walls is no longer urbanized at all, almost like a Byzantium in miniature, only far less grand and far more ramshackle. As such, it would offer a very ‘wild west’ feel for a game, with nothing like the relatively visible authority of a Rus’ city under princely laws.